After a decade of global economic expansion, risks are high as the USA joins Europe and China in a period of synchronised economic contraction. At this stage we do not know whether the slowdown will be shallow or deep but there is risk of recession. Falling house prices in Sydney and Melbourne along with the prospect of a change of Government add to economic risk and uncertainty generally in Australia. 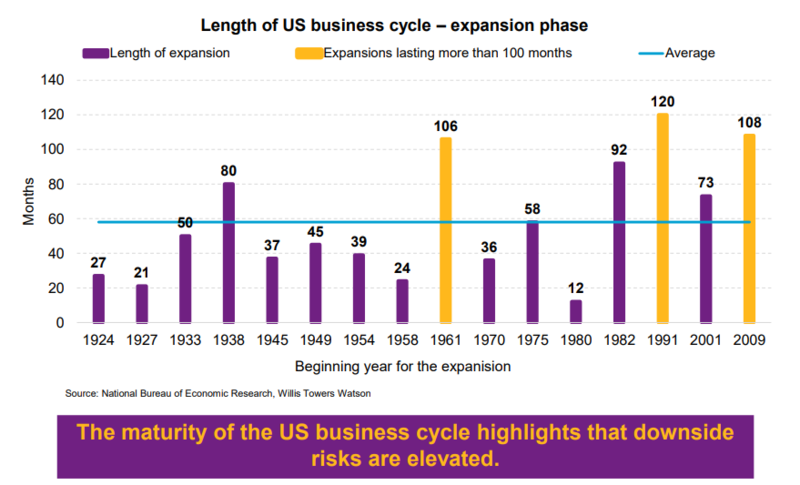 Chart 1 shows the current maturity of the US business cycle – showing the second longest period of economic expansion in the last 90-years. Despite the recent correction of late 2018 and subsequent recovery in global share markets, asset prices in many markets remain high by almost all measures. 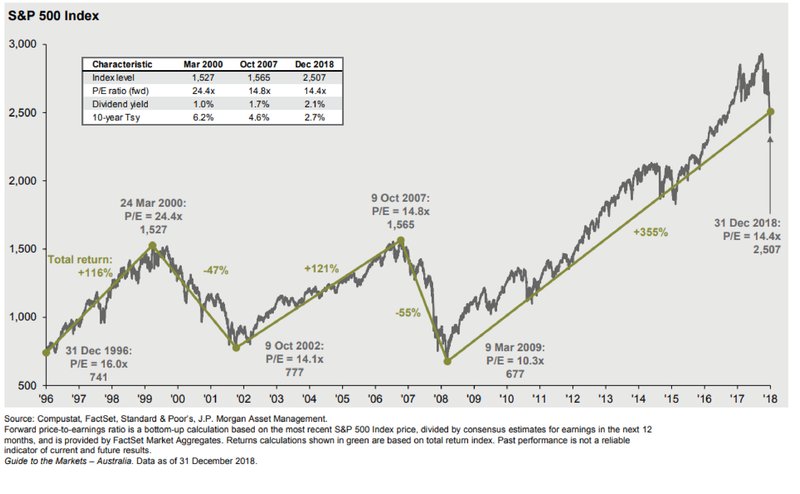 Chart 2 shows US share market movement and valuation at inflexion over the last two decades. Can the uptrend continue or will late 2018 be remembered as the inflexion point? 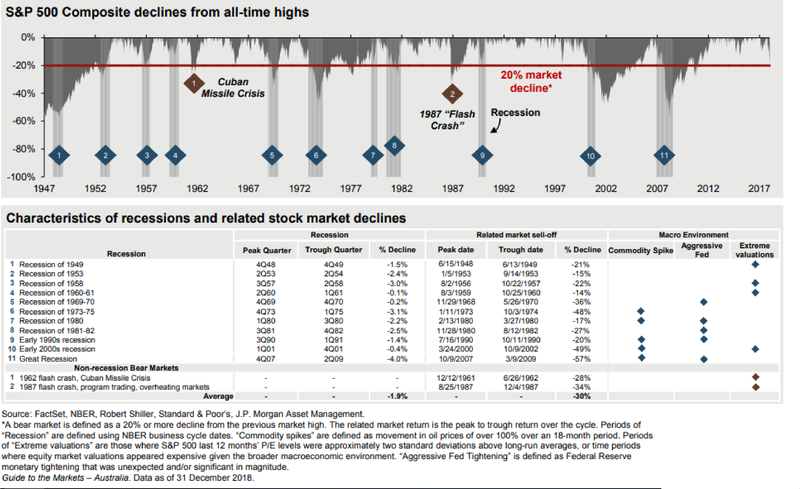 Chart 3 shows the average US equity market fall in a recession from peak to trough is 30% so we need to be very mindful of the effect such a fall (lesser or greater) could have on the ability of individuals to meet their retirement goals. As identified above, the prospect of continuing volatility and falling financial markets presents a very specific risk to those who are planning to retire or those who are recently retired: Sequencing Risk. This risk relates to the most common scenario where a retiree has, at their time of retirement, accumulated maximum capital and they begin to draw on that capital to provide income and meet other goals. Should portfolio losses occur close to the time of retirement, and growth assets are sold to meet planned income or capital needs, then those losses, or at least a portion of those losses, become unrecoverable. Instead of being paper losses, these become real losses. Please see our paper Sequencing Risk for a detailed discussion on this topic. To access a copy of this paper, please contact us. 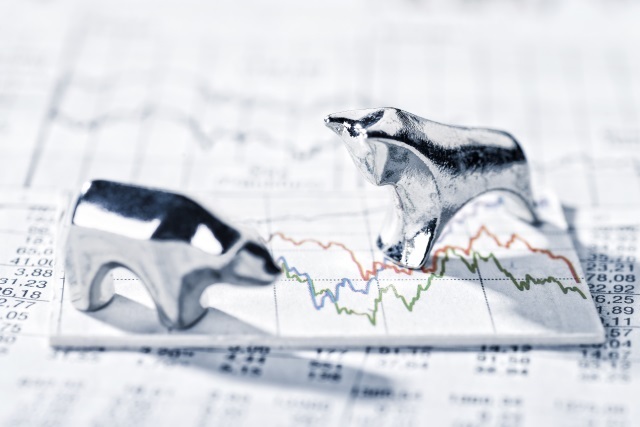 While no one can reliably predict market volatility nor the short-term patterns of return from portfolios, there are some strategies which can reduce risk and provide peace of mind in times such as these. Our full service wealth advisory clients will already be aware of these strategies being employed within their overall financial plan. For those readers who do not have a wealth advisory relationship with MGD, we would welcome the opportunity to discuss and review your financial arrangements. • Capital spending to maintain or change your home or to replace cars, boats, caravans etc. Please see our article What do you really want? for a detailed discussion on how to identify and prioritise the goals that are truly relevant and important to you. 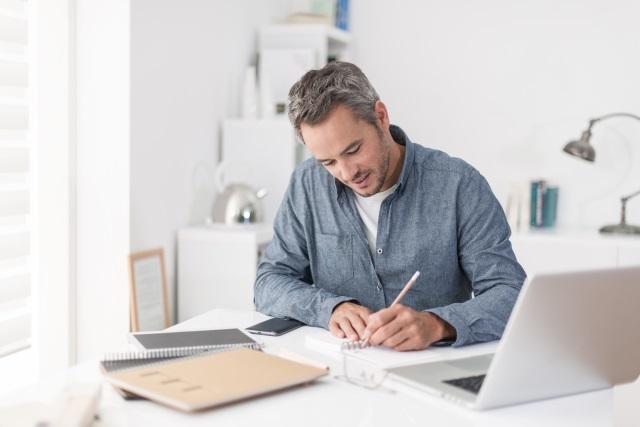 To ensure your goals are met as planned (and are not subject to how good a year your portfolio has had) an effective strategy is to construct an investment portfolio that matches your planned expenditures with appropriate investments. Set aside some of your portfolio in short-term investments to meet your short-term needs, medium-term investments for medium-term needs and so on. Permanent losses occur when you sell long-term assets at depressed prices. By making sure your objectives are met without being a forced seller, your financial position will be stronger and you will feel better, even if there has been a period of market decline. If, based on the evidence, markets are highly valued (or are falling), use an averaging approach to invest capital in the long-term part of your portfolio. Investing portions of your capital over time significantly reduces sequencing risk. Averaging is particularly relevant for those converting a defined benefit account to an accumulation account or taking large lumps of capital and topping up superannuation before establishing a superannuation pension. Perhaps the most important pre-retirement strategy to put in place a few years before retirement is to start building (through superannuation contributions and/or surplus cashflow) a shorter-term pool of liquid capital – or cash. This pool can be used to initially fund retirement income and other objectives and so allow the larger balance of your capital to stay invested long-term. By having cash at your disposal, you won’t be a forced seller of part of your long-term portfolio if investment markets fall. Ideally, the answer is that for an individual client or client couple you have more in accumulated assets than you need. 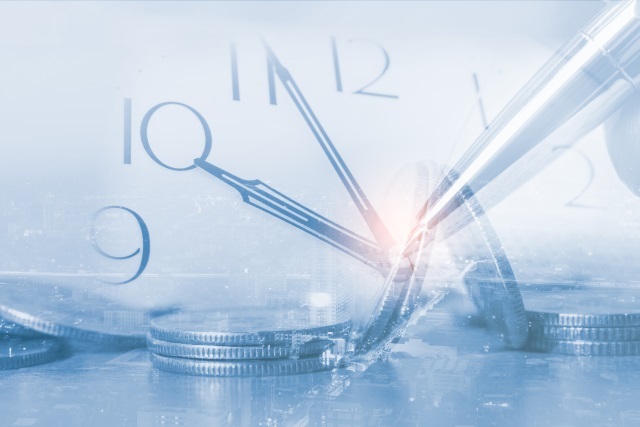 Alternatively, we can project forward and determine how many more years of work may be required in order to accumulate sufficient capital to meet all goals or we can use the calculation as a basis to reset with more modest goals. The simplest adjustment might be to reduce planned expenses or, for example, instead of leaving the house to the kids you might want or need to use that capital to fund aged care expenses. There can be plenty of variables to work with but the key is to have a methodology and an investment framework to deliver to plan. There is a whole field of academic and practical research on behavioural finance: a field which seeks to combine behavioural and cognitive psychological theory with conventional economic theory in order to propose explanations as to why people might make financial decisions that would otherwise appear irrational or suboptimal. The two main culprits for irrational – or ‘knee-jerk’ – decisions regarding money and investing are fear and greed and more recently a new term: FOMO (Fear of Missing Out – describes a social anxiety to do what others are doing). 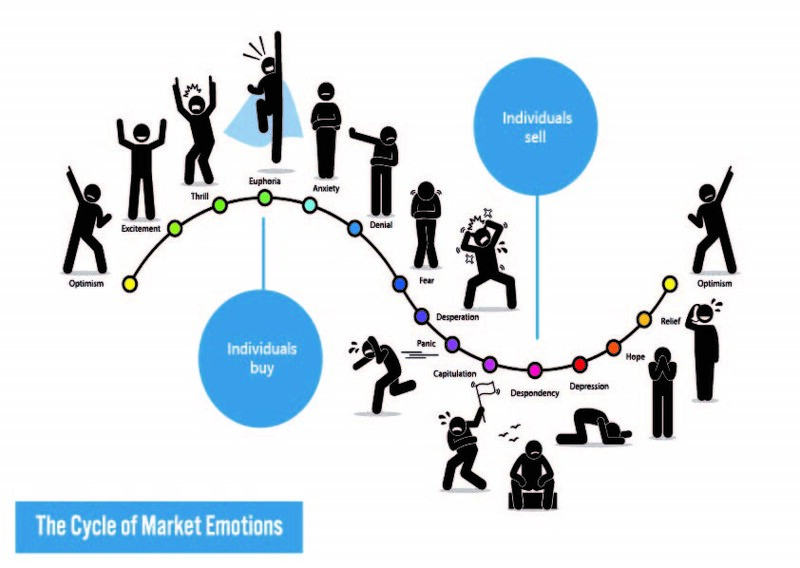 The Cycle of Market Emotions below would be funny if it were not such a true summary of the way our collective human emotions and behaviour amplifies swings in the value of investments which can move ordinary volatility into boom and bust. So, apart from all the other logical benefits, a goals-based approach provides a methodology to minimise irrational decision-making. 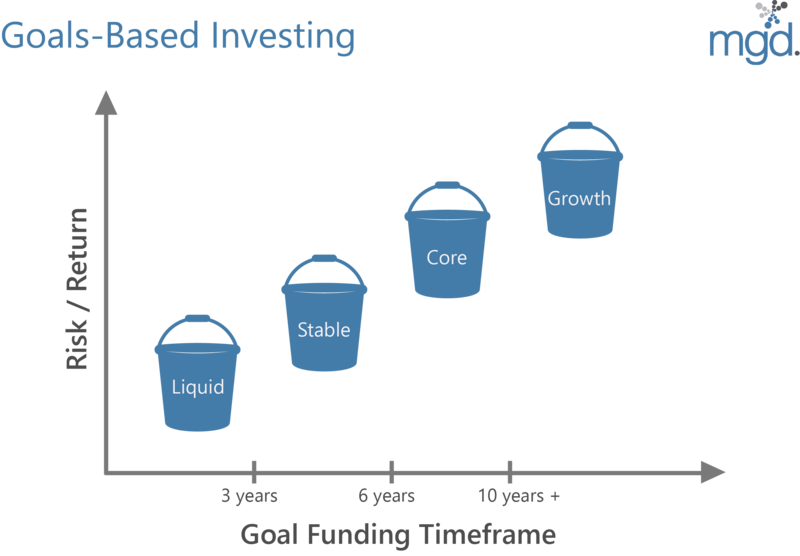 On a much calmer investment journey, short-term goals are met with liquid, short-term investments, a stable pool is ready to meet medium-term objectives and to replace the liquid pool when needed and while growth assets may fall in value, they have time to recover and play their pivotal part in generating higher long-term returns. There is no need to panic in a downturn and life can be enjoyed without unnecessary worry. After the last decade of economic and asset price growth, it is common for investors to remain optimistic or become complacent and assume the good times will keep rolling. Even if you have that view and remain optimistic about economic growth and the future of asset prices, we don’t believe that hope is a strategy going into retirement. In the face of weakening economic conditions and renewed share market volatility, we believe that imminent retirees should structure their investment portfolios to mitigate the risk of loss in the lead up to and in the early years of retirement. With a sound goals-based approach, your asset base can continue to generate necessary income and capital throughout your life and, with minimal stress, allow you to enjoy what you have worked hard to achieve. 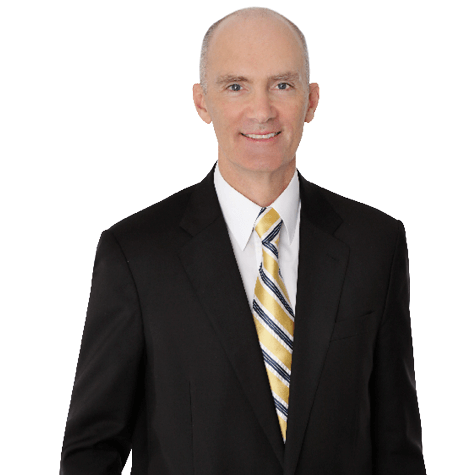 For a review of your situation, comprehensive financial planning and specific advice on strategies to help you retire comfortably, please get in touch. Disclaimer: This article is not intended to constitute financial product advice. Any information provided or conclusions made, whether express or implied, do not take into account the investment objectives, financial situation and particular needs of an investor. It should not be relied upon as a substitute for personal advice.